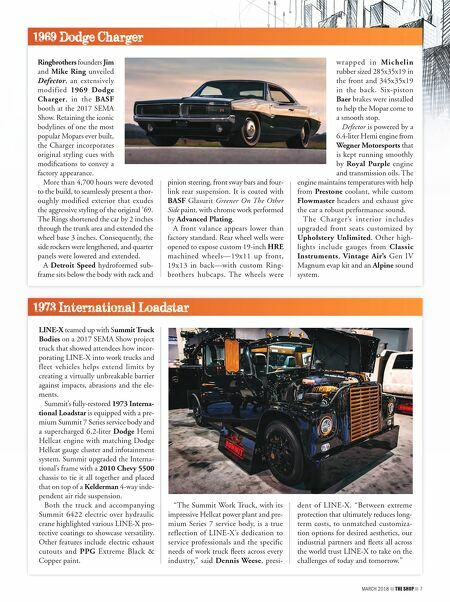 6 THE SHOP MARCH 2018 1962 Chrysler 300 E ach November, THE SHOP presents our annual Project Vehicle Sketchbook, a collection of high- profile builds that helps kick off the trade show season. The late summer deadline for submissions, however, means that some top projects introduced at the SEMA Show and elsewhere get left behind. To shine the spotlight on those builds and others, we're happy to present Part II of this popular feature. Be sure to take some time to study and appreciate these amazing cars, trucks, SUVs and custom creations, not just as entertainment, but as inspiration for that next new job that comes through your bay doors. 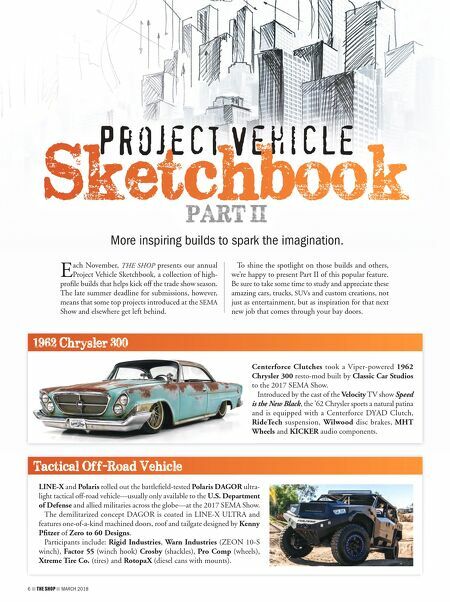 Project Vehicle Sketchbook PART II More inspiring builds to spark the imagination. Centerforce Clutches took a Viper-powered 1962 Chrysler 300 resto-mod built by Classic Car Studios to the 2017 SEMA Show. Introduced by the cast of the Velocity TV show Speed is the New Black, the '62 Chrysler sports a natural patina and is equipped with a Centerforce DYAD Clutch, RideTech suspension, Wilwood disc brakes, MHT Wheels and KICKER audio components. Tactical Off-Road Vehicle LINE-X and Polaris rolled out the battlefield-tested Polaris DAGOR ultra- light tactical off-road vehicle—usually only available to the U.S. Department of Defense and allied militaries across the globe—at the 2017 SEMA Show. The demilitarized concept DAGOR is coated in LINE-X ULTRA and features one-of-a-kind machined doors, roof and tailgate designed by Kenny Pfitzer of Zero to 60 Designs. Participants include: Rigid Industries, Warn Industries (ZEON 10-S winch), Factor 55 (winch hook) Crosby (shackles), Pro Comp (wheels), Xtreme Tire Co. (tires) and RotopaX (diesel cans with mounts).